Try our Green label Melon & Peach Cream e-liquid flavour, it is a perfect blend for the perfect vaping experience. 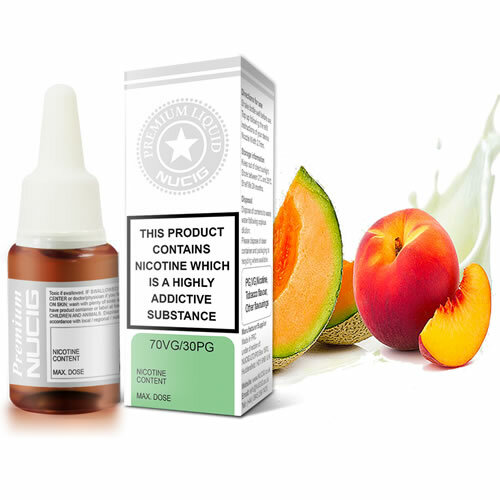 NUCIG Green Label Melon & Peach Cream e liquid contains only the purest and highest quality pharmaceutical grade ingredients and is for those who prefer extra smooth draw. Exclusive MaxVol™ technology delivers a smoother, richer maximum volume smoke (vapor), providing a sweet fruity melon & peach flavour. Specially formulated to extend the life of your electric cigarette atomiser, clearomiser and tank. Nice pleasant flavour,refreshing.I find Nucig fluid the best compared to other brands. I really like this - its now my favourite vape flavour. New nucig customer - very impressed with website, easy checkout and very fast delivery ( ordered Fri 3.15pm, arrived 9am Saturday ). Will recommend to all family and friends.